Dried apricots are not only delicious but are full of valuable nutrients. They are easy to incorporate into your diet, and their sweet flavor makes them an attractive food choice. Investigate the nourishment this tasty fruit offers, and find ways to incorporate it into your diet and lifestyle. Dried apricots contain a number of valuable vitamins and minerals. They are high in fiber, and are a good food to turn to when you’re looking to add extra fiber into your diet. A 1/2-cup serving contains 4.7 grams of fiber, 157 calories and almost zero fat. Dried apricots are a source of natural sugar and have a low glycemic index -- 44 for a 17 piece serving -- meaning that they cause a slower, healthy rise in blood sugar levels as compared with other foods. Potassium is an important electrolyte in the body. It contributes to a healthy heartbeat, and may reduce the risk of bone density loss and kidney stones. Dried apricots are one of the best dietary sources of potassium, containing 755 milligrams of potassium per 1/2-cup serving. The body obtains dietary vitamin A either from animal products in the form of retinoids, or from specific plants containing carotenoids. 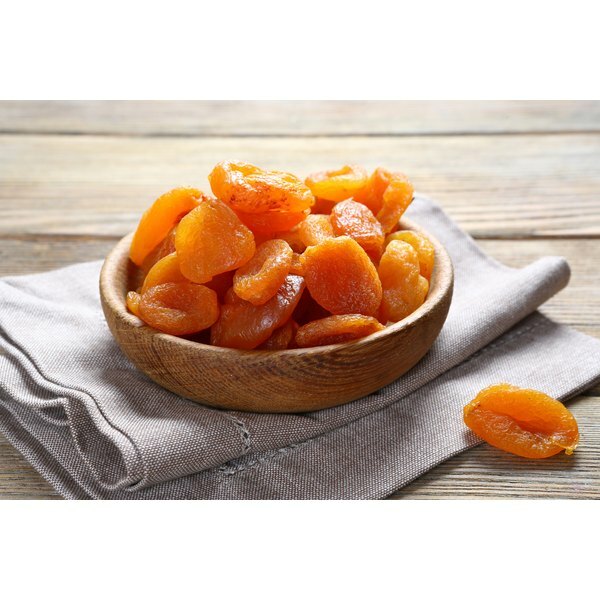 Dried apricots contain a large amount of beta-carotene, which is a carotenoid and a precursor to vitamin A, with 117 micrograms per 1/2-cup serving. This makes apricots valuable to any individuals on a vegetarian diet. Vitamin A provides a number of benefits, the most popular of which being healthy vision. For the healthiest dried apricots, read the labels and choose products that do not have sugar added. Although adding sulfur to preserve the bright orange color is common practice, you can also find dried apricots that have not been sulfured at health food stores. Try drying your own apricots either in the oven on a very low heat, in commercial fruit dehydrator or in the sun. Most bacteria require a moist environment to thrive, and the moisture content of dried apricots is low. Consequently, they have a fairly long shelf life. However, if you are planning to store unused dried apricots for an extended period, seal them tightly or store them in the freezer.